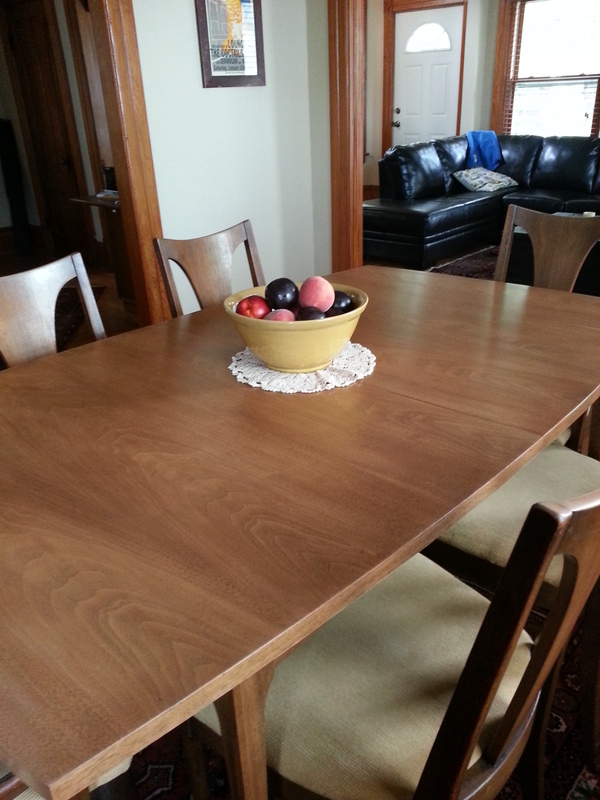 Now is Overrated, or How to Refinish a Broyhill Brasillia Dining Room Table | I'm afraid we're going to have to put you under for this. You know why they say that? Because all that crap you just bought at Target for $300 is gonna fall apart tomorrow. That’s why. So enjoy it now, while it lasts. If you ask me, now–like Target–is overrated. For one thing, now happens all the time. In fact, it’s happening right now. Oh! Hey! It just happened again. Snore! I prefer less hackneyed moments, like tomorrow, which will never happen. I’m also fond of yesterday—the most steadfast of the moments. When you think of the craftsmanship that went into yesterday, doesn’t it just make you want to go back there and live? Like a Portlandia episode where everything is retro and cool. So anyway, if you want to micromanage your breath, by all means apply yourself to the task. 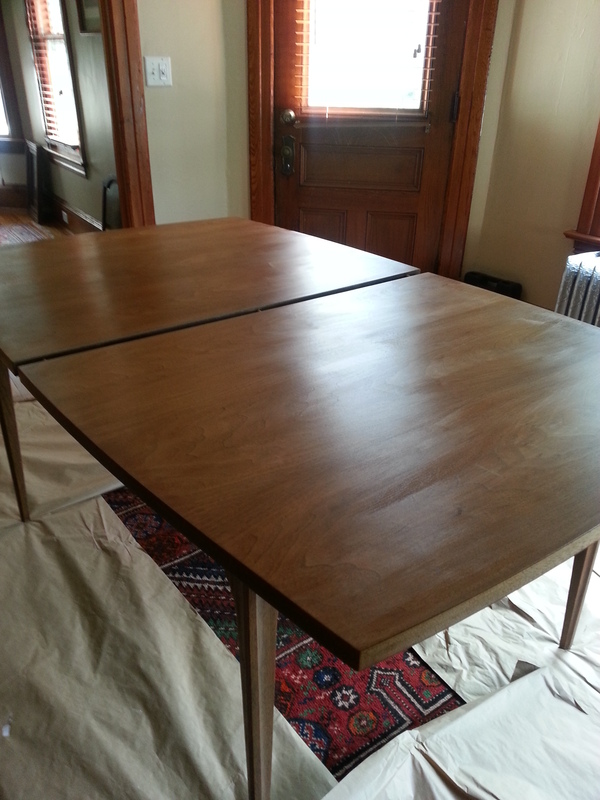 I’ll be over here refinishing this retro cool mid-century modern dining room table. Why? Because yesterday’s stuff is better. And, if you take care of it, it will last until tomorrow. Or maybe even forever…ever…ever…ever…. Apply the stripper with a disposable brush in small patches. Don’t leave it on too long. 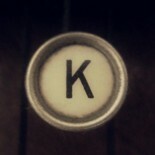 I let this sit for about 45 seconds! Old varnish is more than willing to give up the ghost. The whole reason I’m doing this is because I accidentally removed a patch of varnish with a mild cleanser! Remove the stripper with a scraper, working in the direction of the grain. I’m using a metal scraper, but you should use plastic. 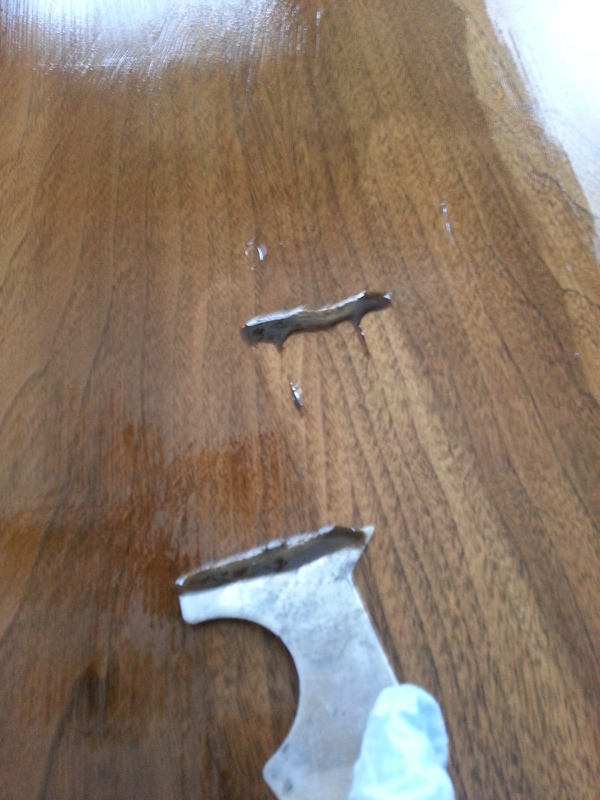 Metal can mar the surface of the table. My metal scraper was in the basement and I was being slothful, which is a sin. Learn from my mistakes, people. Save your souls. Use a bunch of paper towels to wipe off the gloop you just scraped up. 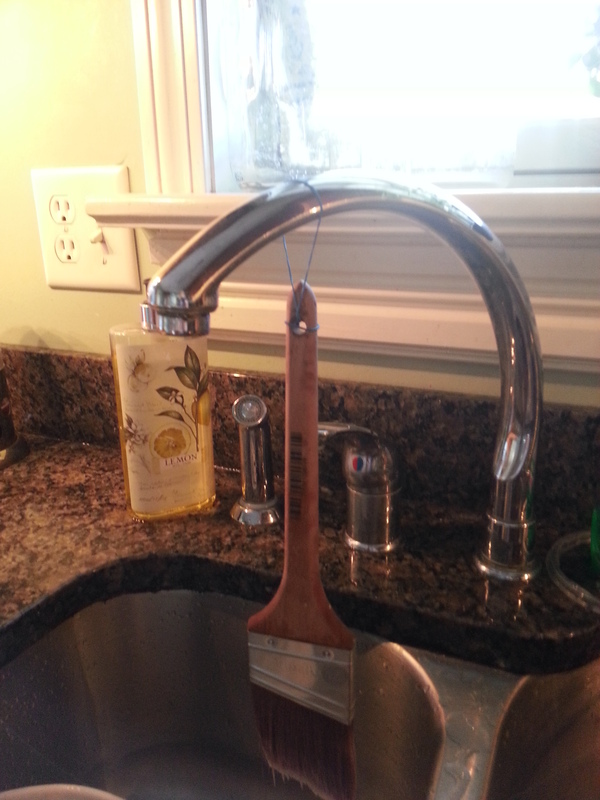 Then use a rag soaked in mineral spirits to wipe the area clean. Don’t be with your breath during this part or you might pass out. Now move on to another small area. Repeat until you’ve done the whole surface. Avoid letting the stripper sit on the edges of the table. That’s where the veneer comes together and is most vulnerable. Also, your stripper might break your table with all that gyrating he’s doing. Whoop! 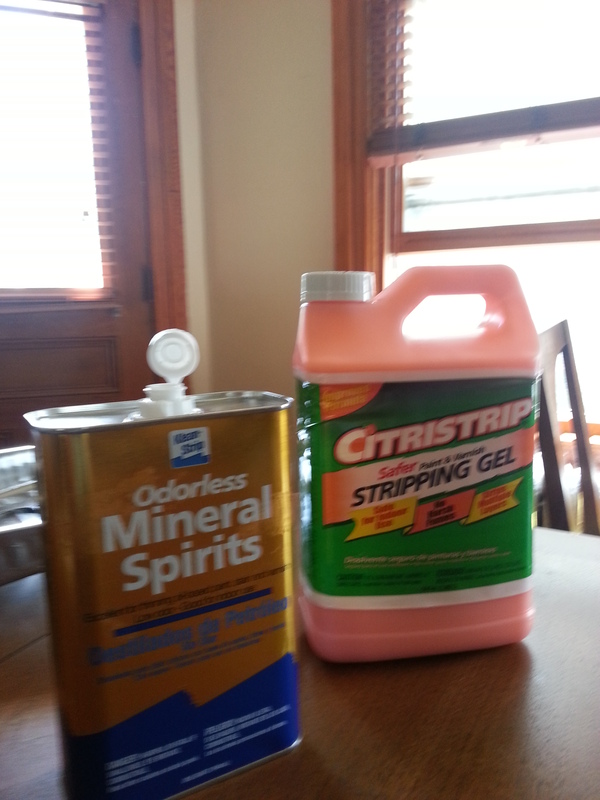 After you’ve finished the surface, lightly apply some stripper to the sides of the table and scrape and wipe with mineral spirits. You may need to go lighter on this area depending on wear, and if the veneer here is the same type as the surface. Use your judgment. That’s what it’s there for. Oh! And don’t forget the leaves! For when your parents come to visit. Apply the stripper again to a small area. Now take a stiff bristled brush or a plastic (not metal!) scouring pad and gently scrub the surface back and forth a few times in the direction of the grain. Press firmly enough to remove the residual varnish but not so hard that you scratch the wood. You’re not cleaning an oven here, Betty. 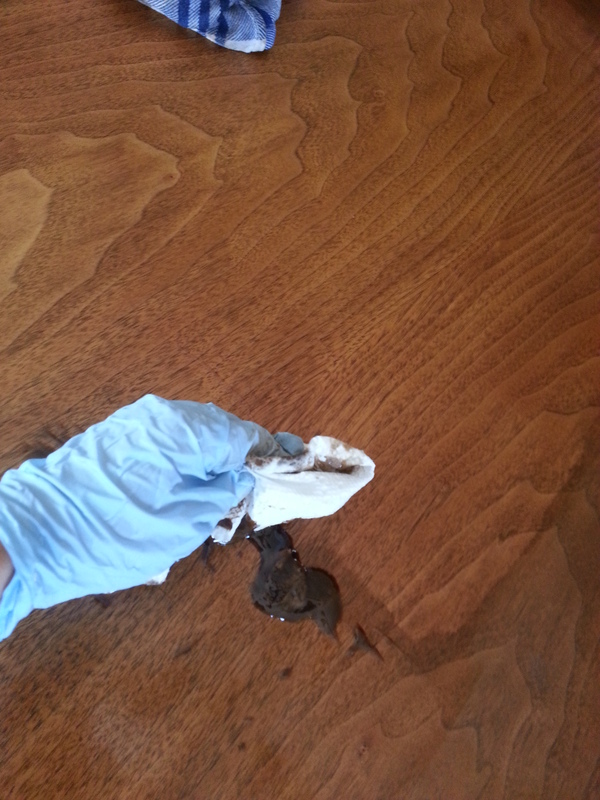 Wipe the area clean with paper towels then go over it with a clean rag soaked in mineral spirits. Once you’ve stripped the table down to an even patina, (for me, this took only two applications) you’re ready to make it match the rest of the set. This can be tricky. The important thing is to shoot for the right color “tone” not necessarily the right color saturation. Because light will never hit the chairs, table legs, and the table surface the same way, some variation in saturation is okay. As long as the whole surface looks the same, you’re okay. I did a few test patches on a leaf that had water damage, and found that this color of “special walnut” matched the original Broyhill Brasillia color the best. It had a muddy graphite tone that seemed to work with whatever the original varnish plus 60 years of time had made. Apply the stain very, very lightly with a clean cotton rag. Again, you want to maintain control over how dark the wood gets. 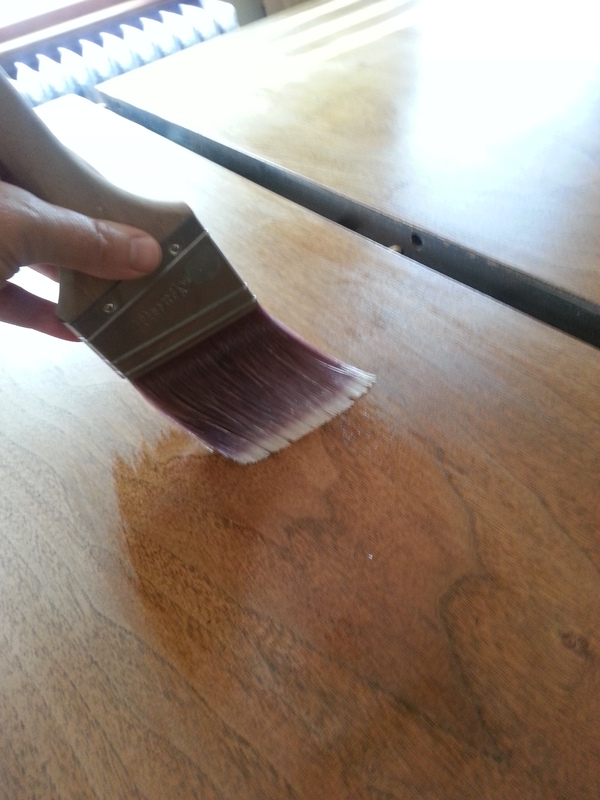 When applying any stain (especially to a veneer) be careful not to let it pool. Even small droplets left to stand for a few seconds will soak in and darken the wood, possibly beyond your wishes. Keep a dry cloth at the ready to catch any splatters, and go slowly, spreading the stain thinly in a small area at a time. 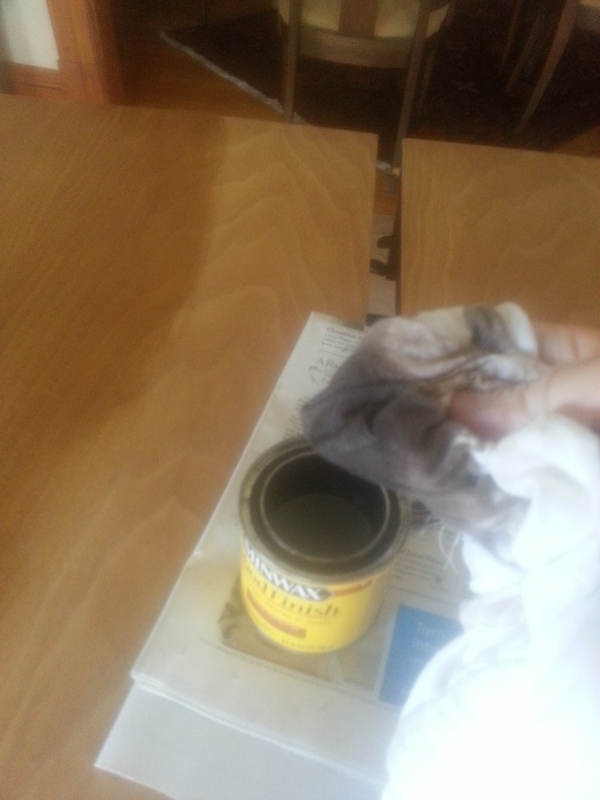 When you have completed the whole surface, let the stain dry before applying a second coat, if desired. The color will lighten slightly as it dries. I found that one, very light, application was all I needed. 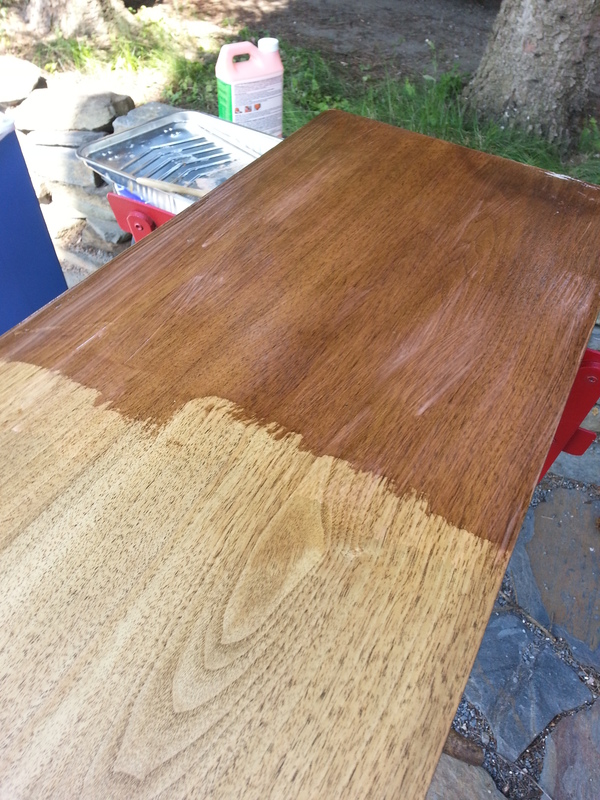 Allow the stain to dry for at least 8 hours, preferably overnight before top-coating. The purpose of a top-coat is to protect the surface from wear and give the piece a finished look. But don’t go overboard on the shiny. A too-glossy finish will just look wrong on an antique. And people will think you’re trashy. Because only whores eat at shiny tables. I used a satin finish. Because I have morals. 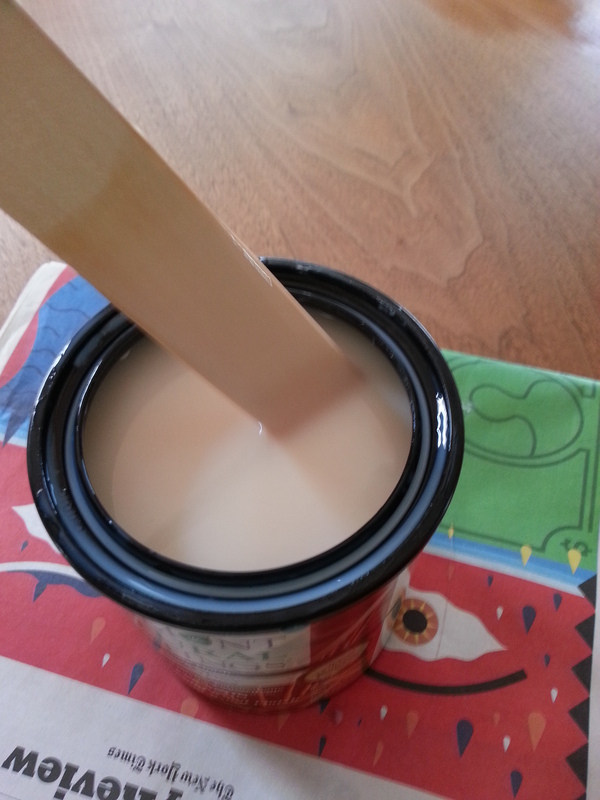 The first coat will soak into the wood, but try to apply it as thinly as possible. Work in the direction of the grain. Work it! Are your triceps engaged? Good. Don’t worry about your brush strokes being visible. We will correct this. All things are impermanent. Let this coat dry over night. Om! 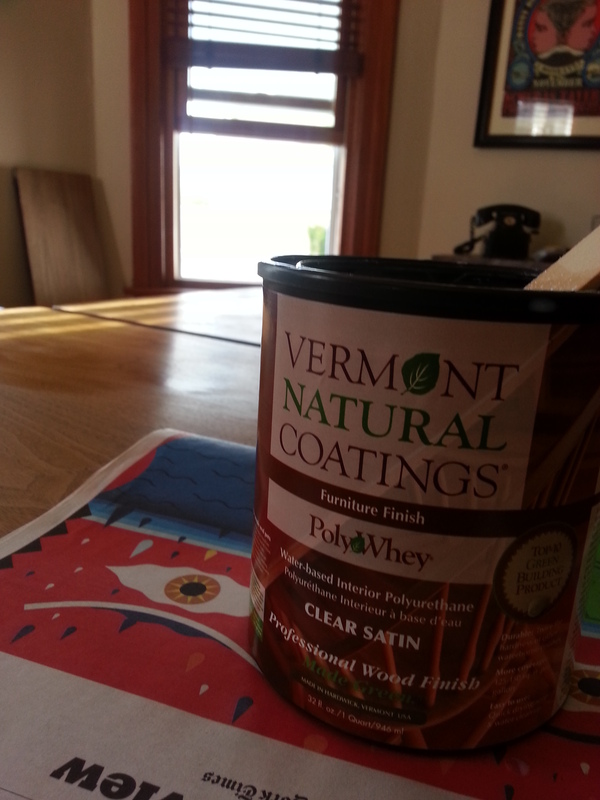 Sanding lightly between each coat is essential to getting a smooth final finish. Use a very light grit (I used 220 with great success) and work it over the whole surface and sides of the table, including the leaves, in the direction of the grain. 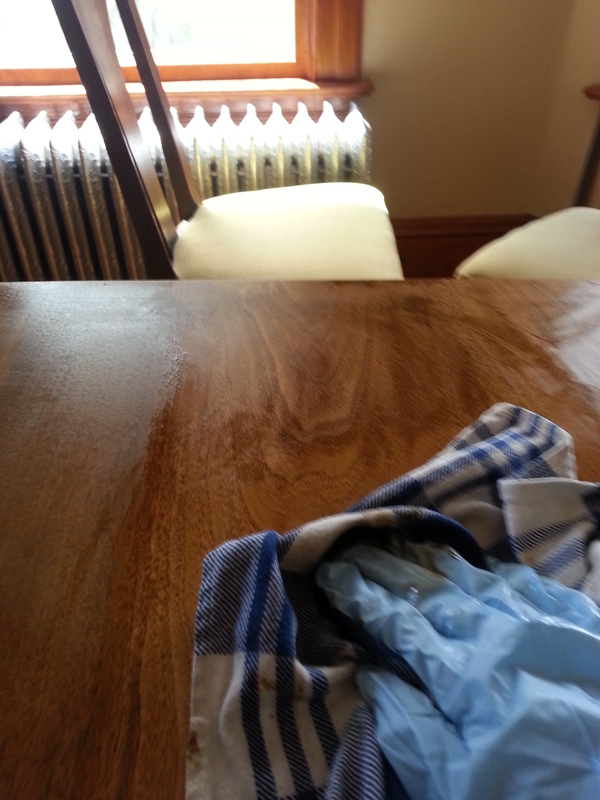 When you’re done, wipe the powdery residue off with a damp towel or a tack cloth. The second coat will go on smoother than the first. Again, apply it thinly. The thinner the better, really. Now is when you should begin to practice your brush stroke technique, which you will need to have perfected by the third and last coat. See how short brush strokes are visible? That’s because you’re not in the moment. Apply the poly in narrow strips, about the width of your brush, finishing with one continuous brush stroke, all the way across the table in the direction of the grain. Do not stop or start midway. Go from edge to edge in one smooth stroke. On the third coat, this will create a flawless surface. And practice makes perfect! 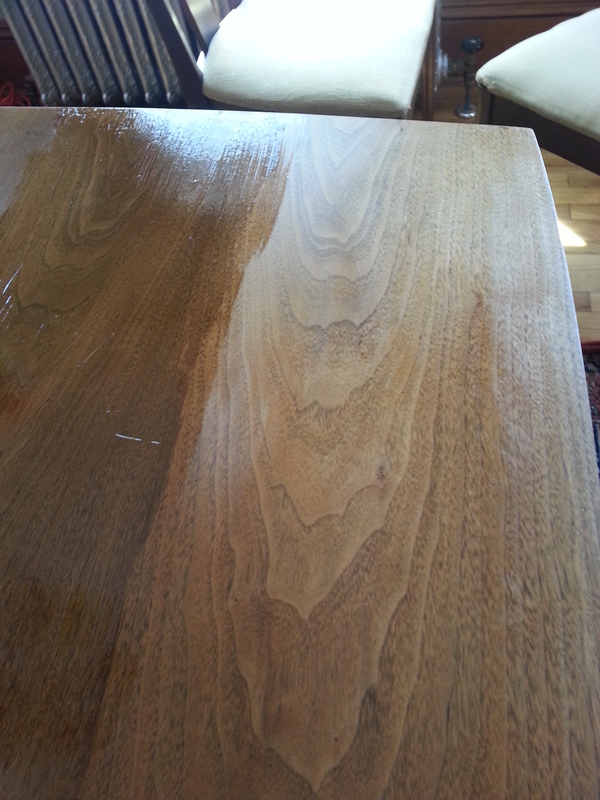 Once your second coat has dried overnight, sand and clean it the same way you did the first time. 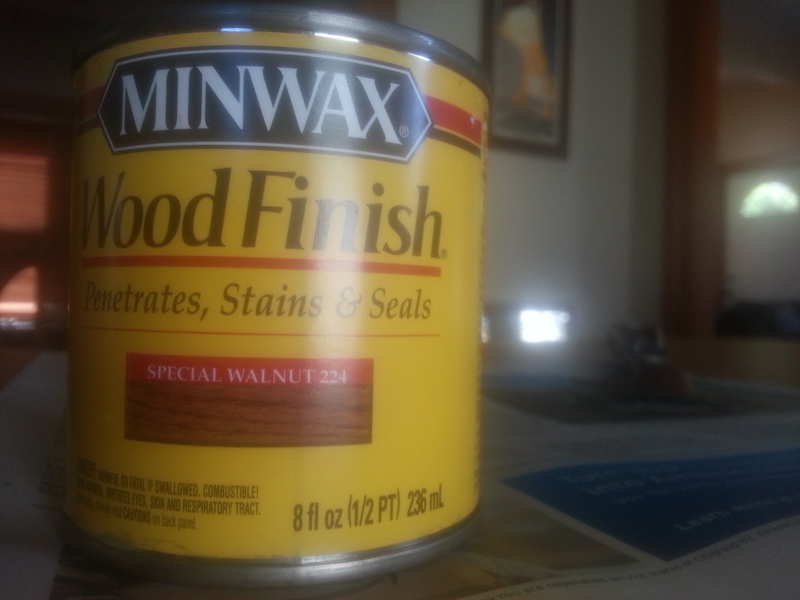 Now you’re ready to apply the final coat. Again, use a fairly dry brush (not dripping!) and apply it thinly, but make sure to finish each section by drawing one brush stroke all the way across without stopping. Attend to any drips along the side! And voila! The new finish looks almost indistinguishable from the original patina. Plus, now you have a piece of furniture that will last you many years of daily use. The finish will be dry to the touch in a couple of hours but will take a week to fully cure. So use the doily your grandma made and go ahead and put some fruit on it. You know you want to! 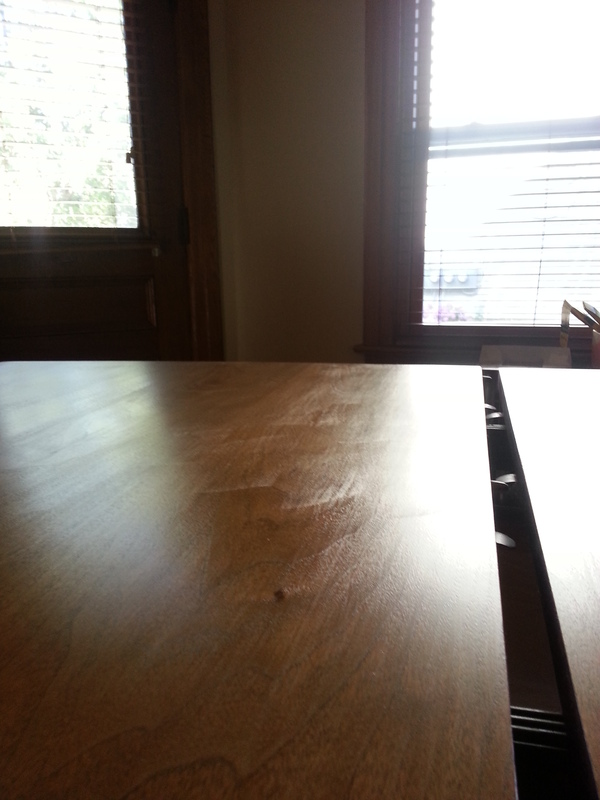 Are all Broyhill table top made with a veener over say MDF or partical board? I’m wanting to restain my table top and paint the legs but scared to try anything and ruin my table top. I’m not sure if all models and years of Broyhill tables were made with a veneer, but you can usually see the seam where the veneer meets the side surface. 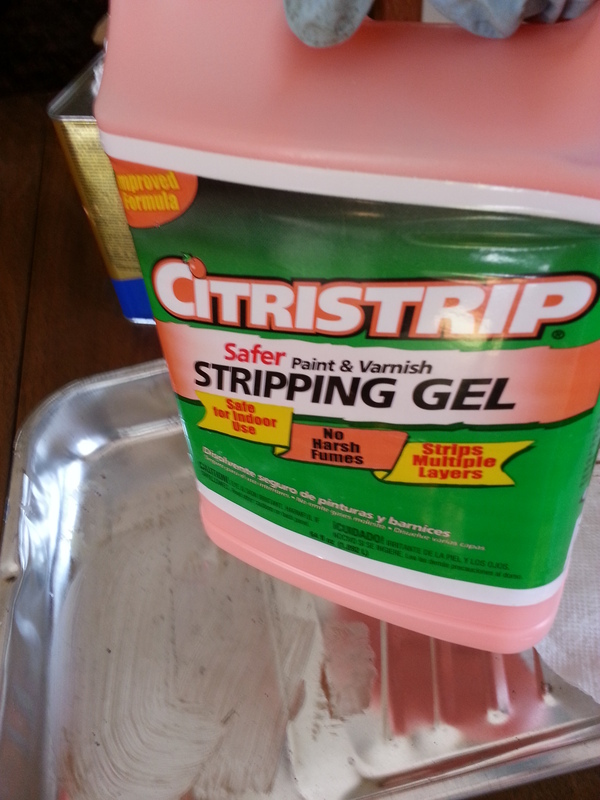 Regardless, if you apply the stripper (and stain) in several light layers (as opposed to one heavy one) you will have more control over the result. Good luck! This entry was posted on August 1, 2013 by Kate Sykes in The Online Journal of Writer Kate Sykes and tagged Broyhill Brasillia, Hipsters, Mid-century modern, Mindfulness, Portlandia, Refinishing Furniture.